West Sussex’s premier and A teams were both in action when they visited East Sussex, with both teams looking to consolidate second spot in the group tables. The premier team started well and just shaded the result 21-19. In the singles Infinity’s Chris Page won 15-10 and drew 13-13 to maintain his unbeaten record for the season but losing his 100 per cent record. Club-mate Jack Rollings won 18-8 and 14-11. In the pairs Infinity’s Robin Armstrong with Lavant’s Peter Whale lost 14-8 and won 20-13 while Bognor’s Clive Andrews and Infinity’s Charlotte Rollings won 14-10 and lost 16-9. In the triples Bognor’s Joyce Abel and Pam Andrews with The Martlets’ Malcolm Rollings lost 12-8 and won 16-9. In the fours Lavant’s Jackie Lee, Terry Haigh and Peter Winter lost 17-5 and 12-5 while Southbourne’s Audrey Bull with Infinity’s Denise Kirby, Steve Jeffery and Richard Jeffery lost 12-10 and won 19-7. The A team started slowly but ended up with a very satisfying win by 28-12. In the pairs Fittleworth’s Bernard Adsett lost 15-6 and won 18-8. In the triples Fittleworth’s Simon and Dave Herbert with The Martlets’ David Luxford won 12-7 and lost 12-8. In the fours Fittleworth’s Jane Adsett and Sonia Burden with Bognor’s Marlene Steel and Crablands’ Mollie Back won 11-6 and lost 15-6 while Crablands’ Elaine Sadler with Fittleworth’s Richard Burden and The Martlets’ Monica Enticknap won 14-3 and lost 13-3. Arun men continued their winning start to the season with three more victories in friendly matches. Scores: P Green, M Bird, K Ball, T Sayers (skip) won 27-5; K Hellyer, G King, M Johnson, J Newell (skip) lost 21-16; J Sparrow, D Jones, J Keers, M Hilton (skip) won 26-19; C Chester, M Millis, J Fox, P White (skip) won 23-20; P Lichfield, D Wright, B Sanford, M English (skip) won 23-20; L Etherington, A Hunt, G Miller, M Campbell (skip) lost 21-18. The following day they entertained West Surrey Bowls Association. The rinks were shared 3-3, but Arun notched a final score of 122-110. Scores: G King, M Bird, J Fox, M Hilton (skip) lost 23-13; C Chester, M Paige, E West, J Keers (skip) lost 12-24; F Hollebone, P Ward, L Pepper, B Pike (skip) lost 18-23; R Lincoln, J Burke, C Burnard, A Avery (skip) won 18-12; K Ball, D Wright, B Sanford ,P Hannam (skip) won 34-17; L Etherington, D Parker, T Hayes, M Campbell (skip) won 27-11. A midweek match against Preston Park saw Arun produce their strongest team of the season so far, and they won comfortably by 161-69, despite losing on two of the six rinks. Scores: R Lincoln, S Webster, M Bird, J Brazier (skip) won 27-8; G King, C Chester, G Stevens, M Hilton (skip) won 30-8; L Etherington, T Hayes, K Ball, T Sayers (skip) won 46-6; B Rebbeck, B Daley, J Keers, M Campbell (skip) lost 10-16; C Gilham, D Wright, B Sanford, P Green (skip) won 32-13; J Sparrow, P Ward, J Burke, E King (skip) lost 16-18. Arun men turned to serious competition when they played Isle of Wight Community Club, with two rinks at home and two away, in the Denny Cup. They shared the two home rinks but won both in the away section. Arun won 83-65. Scores - Home rinks: E Pidgeon (skip) lost 15-23 and P.Hannam (skip) won 18-13; Away: T Sayers (skip) won 24-18 and B Butler (skip) won 26-11. In a mixed match against Piscatorials, Arun continued their winning ways with a 121-108 victory after sharing rink wins 3 -3. Scores: Eileen Lawrence Barry Fitch Mike Bird Maureen King (s)won 22-19; Paul Lichfield, Jan Hazelgrove, Bridget Lawson, John Newell (s) lost 13-17; Iris Brooker, Terri Fitch, Brenda McGovern, Andy Hunt (s) lost 21-22; Brian Lilley, Graham Fitch, Veronica Pickering, Chris Horsley (s) lost 17-22; Lyn Carthew, Betty Williams, Brian Mumford, John Keers (s) won 20-12; Marion Keers, Eileen Fitch, John Brazier, Asic King (s) won 28-16. * Arun played Worthing Pav in an Egham Trophy mixed match – it was very close but Arun came out on top 89-71. Scores - Home teams - Viv Greenaway, Ricky Corkett, Marion Richards, Tony Sayers won 20-12; Peter Hannam, Bridget Collins, Ricky Hobbs, April Janman won 31-21; Away teams - Colin Gillham, Denis Latter, Wendy Adams, Brian Butler won 22-15; Chris Hobbs, Paul Murphy, Betty Spicer, Eric Pidgeon lost 16-23. Arun ladies played a friendly against Worthing and won 92-67. Scores: C Hobbs, Chris Horsley, D Latter, Carol Bowles won 23-9; L Hathaway, Sheila Stocker, Betty Spicer, Marion Richards won 19-14; Iris Brooker, Bridget Collins, Sue Miles, Wendy Adams won 16-10; Janet Boucher, Maureen Bacon, Conley, A Janman won 17-13; Barbara Arnell, Sue Judd, Sheila Jones, M Phillips lost 17-21. Donnington invited Hunston for a friendly match. Captain for the Donnington team was C Hulbert and the Hunston captain was J Hodnett. Donninton always enjoy playing the Hunston bowlers and looking forward to the return in the new year. Rink one saw Donnington’s M Hatton, C Willson, Colin Hulbert and skip A Banham take on B Hodnett, R Moore, J Stubbs and skip A Hack. On rink two Donnington’s B Taylor, C White, A Hawley and skip T Haigh faced T Hack, R King, J Hodnett and skip R Stevens. 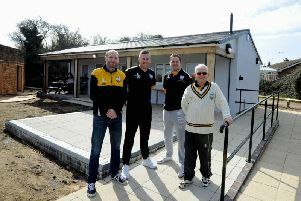 In their second league game, Infinity travelled to Littlehampton to play Norfolk Lions. On mat one Robin Armstrong, Pauline Jeffery, Chris Page and Richard Jeffery won 29-17. On mat two Denise Kirby, Steve Jeffery, Jack Rollings and Charlotte Rollings had a closer game, finishing 22-18. Overall, Infinity won 51-35. Infinity scored six points. On Sunday Norfolk Cubs travel to Infinity at Boxgrove Village Hall to play in the County Knockout Cup. Good luck to both teams. Midhurst Eagles’ match against Lavant Blue saw them enjoy a great start but they lost the thread and lost quite heavily on mat one. Mat two were on for two points but also lost it on the last few ends and the Eagles lost 54-30 overall. Scores: D Morgan, D Berry, C Dixon, T Berry lost 15-32; S Weeks, S Trusller, C Morgan, R Weeks lost 15-22.